We have been without cable TV for about three years. The decision to drop it was rooted in our goals. At the time, our monthly budget was pretty tight and we had decided to really push to pay off our mortgage early. We simply couldn’t justify spending almost $1,000/yr. for that service when we had more important financial goals to tackle. Plus, many cheaper alternatives to receive entertainment had sprung up. We continued our Netflix subscription mostly for kid shows. I kept my subscription to the MLB package so I could stream baseball games on our PS3 and computer. We watched other shows archived on websites and listened to podcasts. We read more books. It’s not like we were without television either. I purchased an antenna so we could receive over the air broadcast signals. This allowed us to get the big four networks (ABC, CBS, NBC, FOX) with an HD quality picture. We mainly watched sports, although that was limited as so many major sporting events have moved to cable. Have you ever gone back home after years of being absent and attended the church you grew up in? Or maybe dropped by a high school basketball game at your alma matter? It’s a weird feeling isn’t it? Some of the names and faces are familiar but so many are new. That’s what we have been dealing with these first three weeks with cable. What are these shows? Who are these broadcasters? On what channel can I find my old favorites? I’ve found it very interesting how we’ve had to develop a cable TV watching routine all over again. It does take some effort to integrate TV viewing back into a daily schedule and get connected again with new shows and new personalities. We’ve been without it for so long we actually forget some days we have cable or that we have a DVR again to record shows. I know…first world problem as so many are now fond of saying. Ditching cable TV three years ago was one of the best decisions we’ve ever made. It saved us a lot of money and created time to pursue other projects and goals. It helped our family spend more time together and freed our minds from the stress of the daily news cycle. Well, it’s partly a timing issue in that we do now have the money in our monthly budget to afford the subscription. We also did get a great deal as we bundled AT&T U-Verse with our already existing cell phone and Internet plans and received a discounted subscription rate. For sports enthusiasts, a lack of cable TV is a real issue. There simply aren’t enough streaming options available yet that are convenient or cost effective to satisfy a person’s fix for all the major professional and collegiate sports. We get games on weekends on the major networks and stream baseball but that’s about it. For me, this is more than just the inability to watch our favorite sports teams. It’s about creating memories, having dreams, setting goals and learning how to handle victories and failures. I know those of you who could care less about sports might not get that so let me explain. Some of my greatest memories as a child revolve around watching professional sports. I’ll never forget the excitement of the 1990 baseball season as I cheered my Cincinnati Reds on to a sweep of the Oakland A’s in the World Series. On the flip side, I agonized over my Cleveland Browns losing back-to-back AFC Championship games to the Denver Broncos. I know that was 25+ years ago, but I can still see John Elway driving down the field in 1987 and Earnest Byner fumbling that football as he ran to score the winning touchdown in 1988. Sports help mark the seasons of our lives. Just like people remember where they were and who they were with when JFK was shot, when Challenger exploded, or when 9/11 hit, so it is with sports. I was screaming with my dad in our living room when Pete Rose broke Ty Cobb’s all-time hits record…at basketball camp when Magic Johnson crushed the Celtics with a baby sky hook in Game 4 of the 1987 NBA Finals…in a college dorm lounge when Christian Laettner hit the shot against Kentucky. Time after time I watched my athletic heroes succeed and fail. Each time it taught me lessons about winning and losing. About sacrifice. About effort. About sportsmanship and teamwork. About striving for something so great it almost seems impossible. I’ve come to the conclusion that my kids can’t miss that. Sure, they could learn those values in other ways. However, as I pointed out here recently, modeling of adult behavior by children is the most powerful way they learn. I clearly tried to emulate the moves of the star basketball players, as I worked out for hours in my driveway over the summers. They had reached the pinnacle of their sport and I wanted to do the same at whatever level my talents would take me. Their example was a catalyst for me becoming a really good high school basketball player. So my oldest two are beginning to enjoy playing basketball as they are in middle school. Having been a coach for many years I can teach them what they need to know about the game. However, I can’t provide the visual learning experience as conveniently for them as TV allows. For me, it’s the #1 reason we brought cable back. Funny thing is, I’ve already seen it working in only three weeks. My 11 year old son was on the edge of his seat this past Saturday night as the Spurs beat the Thunder in overtime of the NBA Western Conference Finals. He doesn’t know anything about these teams but it excited him nonetheless. Paying for cable again just for sports may seem like a shallow reason to you. I’ll agree there are so many other cultural and money related issues that deserve attention. But I cannot deny the value sports provides in creating memories and dreams in the hearts of boys and girls. It’s to that end that I’m willing to sacrifice the money for this service. Questions: Do you have cable TV? Why or why not? Am I overemphasizing the value watching sports can have on children? What’s the greatest sports memory of your childhood? Definitely an interesting decision, but you love sports! We don’t pay for any premium TV service right now, but there are times when I wish we had it. However, I keep busy playing video games in the little free time I have, which is similar. It’s like $3 per month for the online services of the new game consoles. Sorry…that was so exciting for me. The A’s definitely had the better all-round talent but somehow we got it done. Great point Victoria! The friends aspect is something I didn’t touch on. I felt awkward having friends over to watch programming on a cool HD TV where the sound cut in and out. I really missed doing that. It’s a great club to be in and a very wise move for those looking to allocate money elsewhere. I had a big pledge to look into the idea of possibly ditching cable this year, but when I realized the impossibility of seeing sports once you cut the cord, it took a lot of wind out of my sails. Our provider has been fairly reasonable as far as increases so while it might come up again, the idea of cutting the cord has definitely taken a back seat for now. It’s really tough, which is probably what the major networks want. If we could pick and choose what stations we wanted (or what sporting events to watch) in an a-la-carte fashion, the cable companies would have a difficult time making money. And some of the networks on cable would fold because they would not get enough viewers if left to stand alone for themselves. It would be a win for consumers though and I think Netflix and/or Apple might be the only companies right now that could make that scenario happen in the future. I have been without cable for over 3 years now, sports was one of the few reasons that I clinged to it for so long. Other than sports all I felt like I was really losing was about 25 different reality shows that I didn’t watch anyways. I have found some streaming sites online for sports where they basically have all the sports I could ever want to watch, but the only issue with it is that it’s not very clear. The players are a bit pixely and for basketball sometimes you have to rely on the audio to know if they made the shot or not. For me it works well enough, when I would commute I would listen on the radio so it’s a step up from that. But overall it’s not the best viewing experience and I don’t think if I wasn’t attached to the teams already I would be as interested. I wouldn’t go back, but at the same time I don’t have kids. If I had kids I’m sure I would try to promote sports as much as possible since I played sports for so long growing up. I found some of those sites too Zee. Not the best viewing experience at all. The one I mostly used on occasion had sketchy pop up ads that I wouldn’t want my kids to see. We went without cable for the first few years together when our budget was tight, not having that expense saved us several thousand dollars. We now have the Comcast triple play, which unfortunately raised our rates recently, We need a land line phone because cell reception is poor in our area and we get good use out of high speed internet. I would say we pay about $60 a month for the actual TV cable part of the bill, which for the entertainment value we receive is worth it. If the TV is used for 2 hours a day on average, then I am only paying $1 an hour for entertainment, I guess if we watched more TV it would be even less. Breaking it down like that puts a good light on it. In comparison, a person would be paying $4-6/hr. to go watch a 2-hr. movie on a Friday night. This is value-based spending, Brian. We don’t watch a ton of sports on tv, and I do think it can get obsessive and out of hand, but at the same time, I love letting our kids watch some sports because it shows what can happen if you really commit yourself to doing your best at whatever goal you choose. You are right…It can become obsessive which is a downside. So just like any other form of entertainment, we will limit and monitor how much/what we watch…especially the kids viewing patterns. “…a celebration…” That’s a good point Holly! The kids certainly look at it that way. They were begging for us to get cable back long ago. We kept saying not until the mortgage is paid off. We have cable and we mainly keep it because we use it and we don’t go out much so it is our main form of entertainment. I love watching shows like Mad Men and my husband is getting into game of thrones. Like DC I’m looking forward to the World Cup. Its the only sports tournament I love to watch. I’ll be watching in the Spanish networks as I like the excitement and passion they bring while calling the games. We are going to have to investigate the current shows all over again. We really don’t know what’s on. Although I’ve heard great things about Mad Men. Sports are definitely a big reason we have cable. It’s also really our only “entertainment expense.” We don’t go out a ton, and when we do it usually doesn’t involve spending a lot of money. I’m so pumped for the World Cup games! They’re all on ESPN so I’m glad we have it. Ooh…the World Cup! I had forgotten about that. It’s the only time I really get into soccer (other than my kid’s games) but I really enjoy that event. I was in a Duke dorm room when Laettner hit that shot against Kentucky. I remember the entire campus erupting. It was one electrifying moment. I’ve just returned to the USA from traveling for months with 4 months in Indonesia. First thing I wanted to do was watch a ball game. Any ball game. Spending money on cable, if its part of the budget, seems completely reasonable to me. As it turned out that was his high point. Had the Olympics with the original Dream Team and an OK pro career but nothing spectacular to write home about. But at least he had that. I’m feeling your past pain about sports as I scramble to find how I can watch the LA Kings without having to go hang out at a bar. I ended up finding a free streaming site last night so I was pretty darn happy to watch the kings advance to the stanley cup finals. But other than that, I don’t care about sports so not having cable hasn’t been a big deal. I do find it sad that more are not broadcast on regular tv so people without cable can watch. I do remember so much of that being on regular tv as a kid. Right now TNT and ESPN are really bringing in a lot of sports programming. In addition, all the college leagues are beginning to have their own networks to broadcast football mostly. It’s sad that now on the weekends I turn on the major networks and see infomercials where there used to be sports programming. I think it’s great that you brought the cable back. Sometimes when we get in the frugal mindset it can be a little difficult to let yourself splurge a little bit. We currently don’t have cable because we are working hard at paying off our student loans. I’d continue down that path Liz. You will feel great with those loans paid off. The sacrifice now will be worth it. We are without cable for mostly the same reason – a way to save money, putting it towards our debt. We also found that we were wasting time mindlessly watching tv. When we get out of debt, cable really isn’t on our list, unless it’s part of a great bundle opportunity like you have. Enjoy your sports, I am glad you have gotten to the point where the entertainment is one you can freely possess! “We also found that we were wasting time mindlessly watching tv.” That is a real trap Sherrian, one that may have tripped us up a bit before. Having been without it for so long and with so many other activities going on in our lives right now, I don’t think we will fall into that frame of mind again. I’ve realized it has value to me but only to a point. Yay! We’re not alone in the PF world as someone else who pays for tv (especially for sports, too). I think it’s one of the very best values for entertainment that you can get. We do split the bill with our renter, so that helps. Television is just a medium, though. I always find it odd that people don’t like a medium…it’s like saying you’re against literature or the internet, etc. Paying for it is a separate issue. But, one, there’s no such thing as a free lunch and, two, we generally all have some ‘nice to have’ things in our budget. What you choose to spend your money on re: entertainment is completely arbitrary. It only matters in the context of your financial goals. I mean, we’re saving 80+% of our income…does it really matter if we spend a few bucks on tv? At a certain point, you get diminishing returns on your savings efforts, you know? “…we generally all have some ‘nice to have’ things in our budget.” I think you are right about that. For some it might be movies…for others buying books…for others specialty foods. It’s all relative to what we see as valuable to us. You’re glad to have the sports back — I’m excited to be able to watch current Doctor Who episodes! I have no problem with cable if you value it and use it, and it sounds like you certainly do. Many of my childhood memories are associated with TV as well. I remember watching the Grammy awards before Michael Jackson was so weird where he won a million trophies. I remember it was snowing and we were hoping for a snow day so my Mom let me stay up. Really one of the only times my family ever sat down together was to watch Kentucky basketball games, and thanks so much for bringing up Laettner! That’s reason enough to cancel cable because they show that game all the time on ESPN classic! 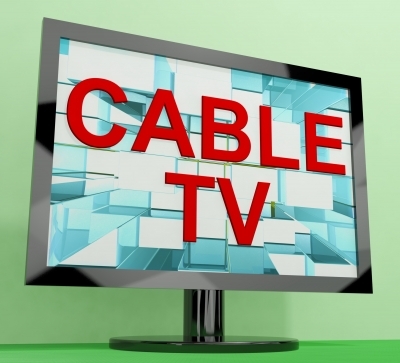 We don’t really see value in cable right now, but that could certainly change down the road. “…bringing up Laetner!” LOL…sorry about that Kim! Knew I would hit a nerve with someone on that. 🙂 Our dorm lounge went crazy when that happened. Everyone was screaming…half in joy, half in agony. I’m happy and excited for you, Brian! While I only have basic channels because it’s a mere $12 / month, I think that being debt-free earns you that right to bring back the things you’ve gone without! Enjoy! “…earns you that right…” That’s how we felt as well Natalie. I just called to setup my internet at the new house and they were trying to get me to buy cable. I told them that I would only if they could offer channels a-la-carte. I don’t watch many channels and most are free over the air. I haven’t tried to put up the antenna yet at the new house, so hopefully it works! I would not skimp on the antenna. We got a mid-range price one and it worked OK. We had some issues with sound quality during some broadcasts and during commercials. It seemed when there was a lot of graphics and voice, the sound would cut in and out. Kind of sounded like a garbled cell phone call. It may have just been due to the location of our property not being able to receive the signals very well. I think if we mounted one on the side of the house it would have been better. But I didn’t want to go that route. We have cable TV…in fact, we have probably the largest cable TV package that our provider offers. You know why? Because we use it (we watch shows as a family and individually), I feel it’s worth the money we pay for it (bundle deal with phone and broadband), and because we can afford it. If we couldn’t afford it, or if I didn’t feel we were getting our money’s worth out of it I’d drop it in a hot second! It would pretty much be a worthless expenditure if you didn’t use it. We watch a lot together as a family to. There is actually quality programming on that can be beneficial to family togetherness. It’s nice to be in a position to enjoy these pleasures a bit. We did miss it for sure but it was worth the sacrifice. You know I’ve been thinking about this a lot lately, Brian. We haven’t cut our cable yet (for us it’s the last thing to go) and I don’t even like sports that much (except for Olympics). BTW, as a baseball fan, I think you will like my latest post. I thought, well if Brian, Kay and Shannon can do it, so can we! Of course, now that you’ve brought it back, I’m starting to reconsider. Hee hee. So we are getting ourselves organized for this, albeit not very quickly. Summertime is probably the best time to quit cable because we don’t watch TV as much. So yeah, I think you’ve got valid reasons to have it again for the sports. Me I want it for THE LITTLE COUPLE, that’s my fav show and I haven’t figured out how to stream it yet. I know it’s a huge money drain for some and wouldn’t argue obviously with anyone who decided to cut it from the budget. To me, it’s all about the big goal at the time. If you can live without it and put the money somewhere better, then go for it. Because we did that awhile back, we reached a goal and now have some disposable income to spread around again. And our goals have changed as I shared in the post. I love the lessons here! Sports were not something my family really watched as I was growing up. For some reason, it wasn’t until about high school when my extended family started getting into baseball and hockey. It’s definitely fun to cheer and yell at the TV with everyone else in the room! Unfortunately, as my parents and I have moved, we no longer get most of the games with NY teams on TV, so it’s faded a bit. Also, if you think about it, three years of being cableless isn’t that long in the grand scheme of things. Well worth it to get that mortgage paid off. There were times when it seemed longer, especially when I couldn’t get all the Ohio State football games. Of course, some of those weren’t worth watching anyway. Congrats on getting to add cable back into your life! Sports was definitely the biggest hurdle my hubby had when we cut our cable this year, but like you had your goal of paying off your mortgage, we have our goals as well and cable was impacting the speed to which we can achieve those goals, so for now he will have to only have those events on local channels. I went through some withdraws in the first few months without it. But I settled down through years one and two. Then I started to miss it again in year three and think about the impact not having it might be doing for my kids sports growth. The final straw came when most of the NCAA basketball tournament moved to cable. I couldn’t see the Final Four because of that. Haha…I was going to mention the Dorsett run. I loved the Cowboys growing up and that run was unbelievable to me. And I agree on not doing anything shady to get games. I know people who do but that’s an integrity issue for me, which I’m not willing to compromise to save a few dollars.